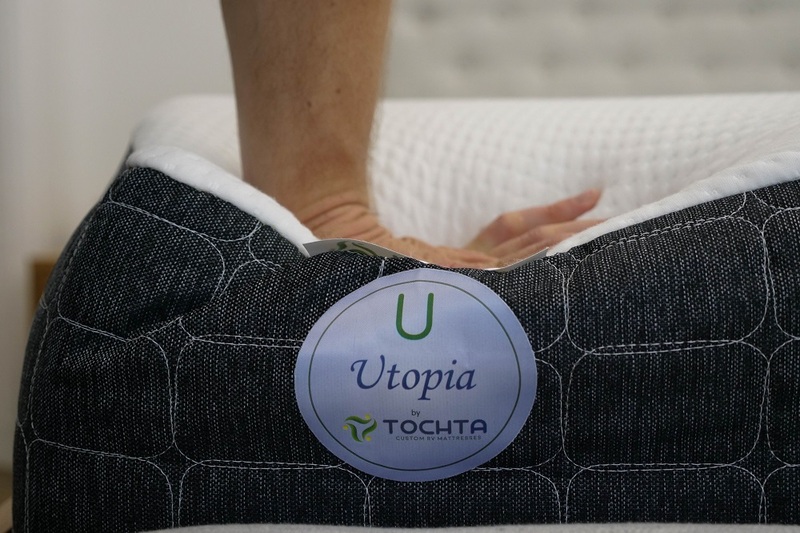 Tochta Utopia Mattress Review - Do You Need a Custom Bed for Your RV? Today I’ll be taking a look at a unique brand in the bed-in-a-box sphere: Tochta, a mattress company that specializes in creating customized luxury beds for trailers, campers and RVs. 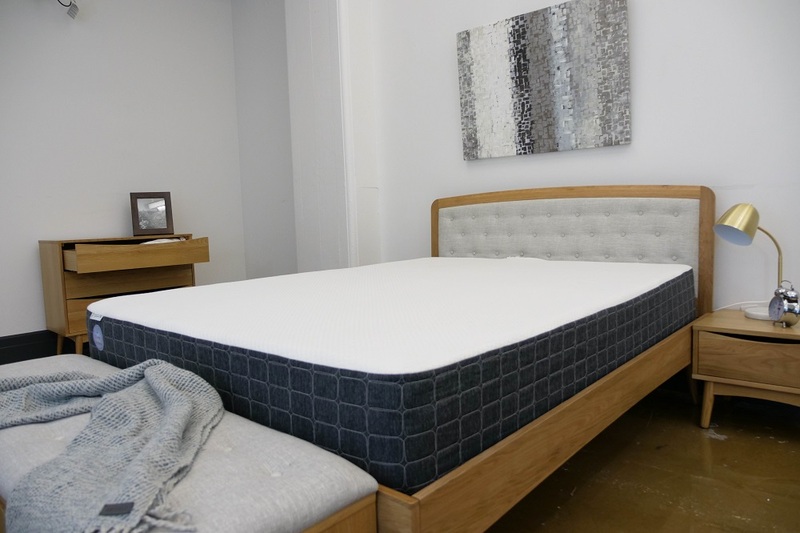 Customers are involved in nearly every aspect of the mattress’ design (from profile height to thickness all the way to corner shape), ensuring that the finished product is absolutely perfect for their space. While all this customization is very cool, I’m not going to be sold on this puppy until I put it through a few tests to figure out how it feels, how it sleeps and whether or not it could be the mattress of your dreams! 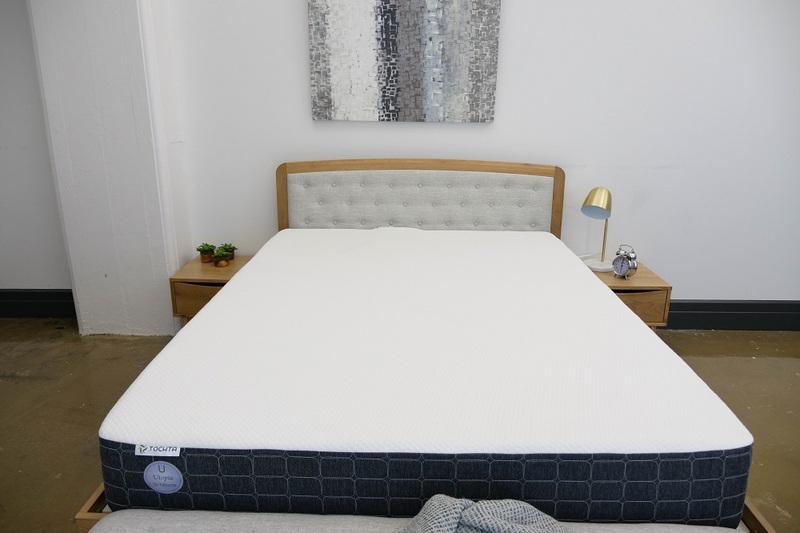 Continue reading below for my full review of the Tochta mattress. Don’t have time to read it all? Click here to skip to the bottom and check out my review summary. 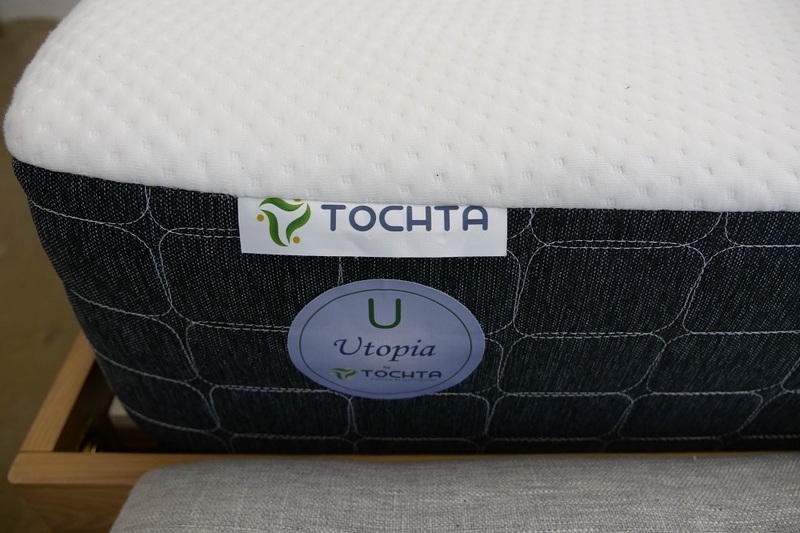 A small note: Tochta currently sells three different mattresses, the Journey (three-layer foam design), Cortana (“luxury firm” latex) and Utopia (“premium” model built with memory foam). For the purpose of this review, I’ll only be looking at the Utopia. The Tochta Utopia features an all-foam construction made up of four distinct layers, measuring up to anywhere between four to ten inches depending on how you customize the bed. The design includes both memory foam and latex, which should create an interesting interplay between deep pressure relief and bouncy support. I should mention that the Tochta comes in 12 standard sizes (ranging from an RV bunk to a California King), but that you can also customize the thickness, width and length to create a myriad of sizes in between. And in case the space in your RV or truck has an odd corner or two, you can also opt for either an angle, notch or radius corner cut. That being said, while I am reviewing a standard Queen size Utopia mattress, this is just one of many shape and size variations available from Tochta. To see how all of this comes together, let’s dive right into the bed! Cover – The cover is made of a polyester/spandex blend, which makes for a stretchy material that won’t bunch up as you move around. It’s also pretty thin, allowing for some nice breathability up top. Comfort Layer – Built with soft gel visco memory foam, the comfort layer provides the sleeper with immediate relief. While you’ll likely experience some nice contouring at the shoulders and hips as you sink into the material, you shouldn’t feel too stuck in the bed as it has a surprisingly quick response to pressure. And though memory foam has a bit of reputation for overheating, the gel infusion here helps to mitigate this and keep things cool. Bounce Layer – Up next, you’ll find a layer of latex foam. This material works to extend the compression of the top layer deeper into the mattress while also providing a bit of buoyant lift to keep you positioned on top of the bed. It’ll also help with temperature regulation throughout the structure as the material doesn’t really trap body heat. 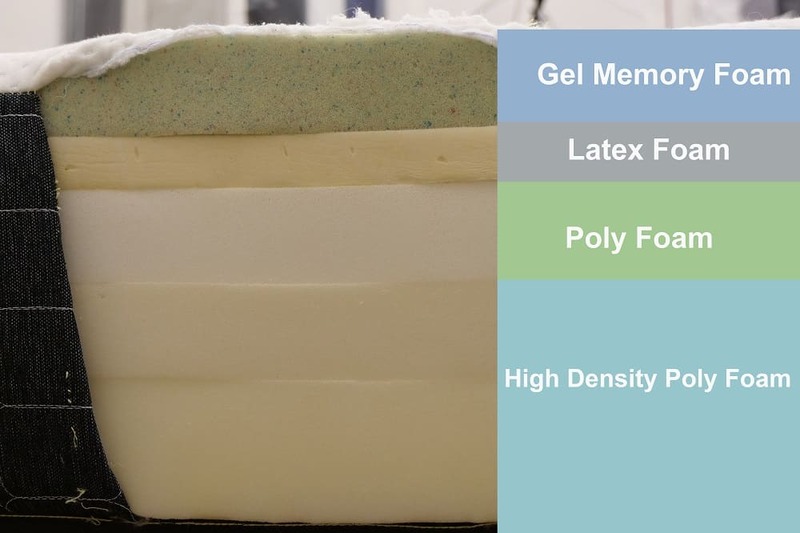 Transition Layer – Below the bounce layer lies a section of proprietary transitional foam. The main function of this layer is to gradually ease the sleeper into the firm base. Foundation Layer – And finally, the base of the mattress, which is comprised of high-density poly foam for durability and support. I should note that because of the ability to change the height of Tochta mattresses the layers will change slightly with that customization. Utopia mattresses that are 7” in height or above will remain four layers, with 6” Utopias will consist of three layers of foam. Tochta Utopias that are 4” or 5” will be two layers, a 2” gel memory comfort layer over a base of high density poly foam for support. After taking a look at the construction of the Tochta, let’s chat about the firmness and feel. I started off by applying light hand pressure to the mattress and found that I was immediately interacting with the gentle memory foam top layer. I sank in easily into this top section and felt some satisfying comfort from the material. Since folks of different sizes and shapes are going to feel firmness differently, I decided to bring in three other testers to help me figure out the Utopia’s overall firmness. To do this, we each took a turn lying on the bed, decided on our own personal firmness rating and then compiled all of them on the graph below. 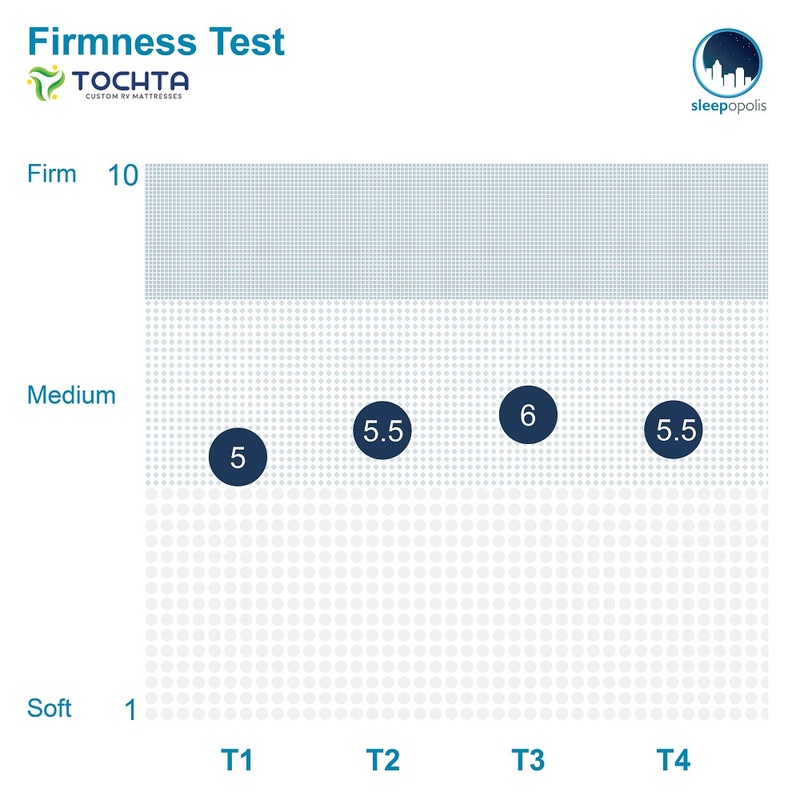 My testers provided a range of responses, but landed on an average firmness rating of 5.5. 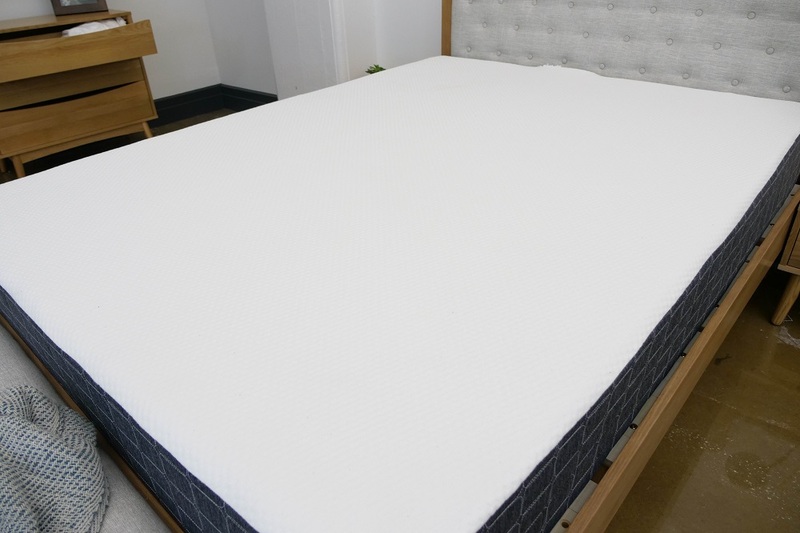 When compared to the industry standard of 6.5 for medium firmness, it’s clear that this bed is pretty soft. I personally gave the bed a 5, finding its all-foam design made for a super gentle feel. The top layers in particular are likely to provide the sleeper with some deep body contouring and pressure relief, which is especially good news for side sleepers. If you think a 5/10 might be too soft for you needs, keep in mind that Tochta’s two other beds (the Journey and Cortana) are designed to be firmer than the Utopia. Another important component of feel is pressure, or where you’re likely to feel pressure points form while lying on top of a bed. Rather than just describing where these tension spots might crop up, I thought I’d provide you all with a visual representation instead. Showing the pressure map results for the Tochta Utopia when I lied on it in multiple positions. Back – Lying on my back, I felt some solid pressure relief from this mattress. I could feel myself sinking into the top layers, which helped to relieve tension at my lumbar region. While I definitely experienced some pleasant contouring here, I didn’t feel stuck in the mattress and found it easy to change positions. Edge support – Scooting close to the edge, I noticed some pretty deep compression through the top layers. All-foam mattresses like this tend to struggle with support at the side, and I certainly noticed that here as well. However, I would say that I never felt as though I’d roll out of the bed. 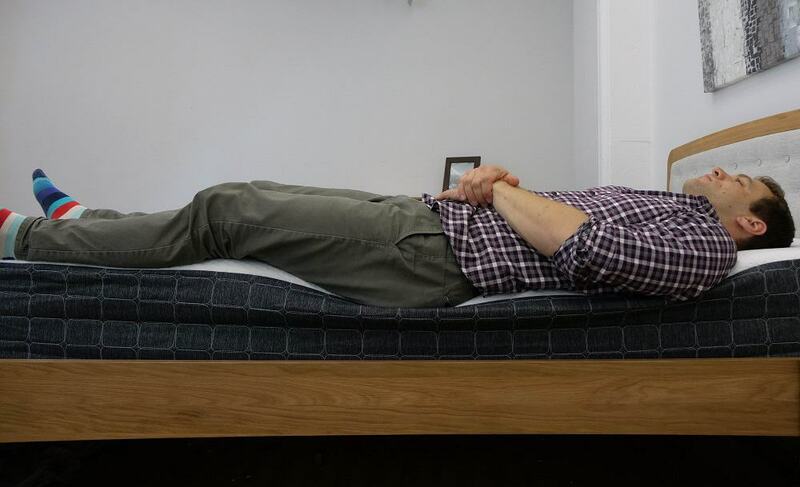 Side – Side sleepers tend to prefer softer mattresses as they do a better job of cushioning the shoulders and hips, typical problem areas for those who doze primarily on their sides. As I mentioned above, I found the Utopia to be about a 5/10 on the firmness scale, so found a lot of fantastic comfort in this position. Stomach – While the softness here is a great asset for side sleepers, the same can’t necessarily be said for those who slumber strictly on their stomachs. The Utopia’s deep contouring makes the hips sink out of alignment with the shoulders, causing a bit of discomfort in this position. Stomach sleepers may find more to love in the Tochta Cortana, the bed’s firm latex model. 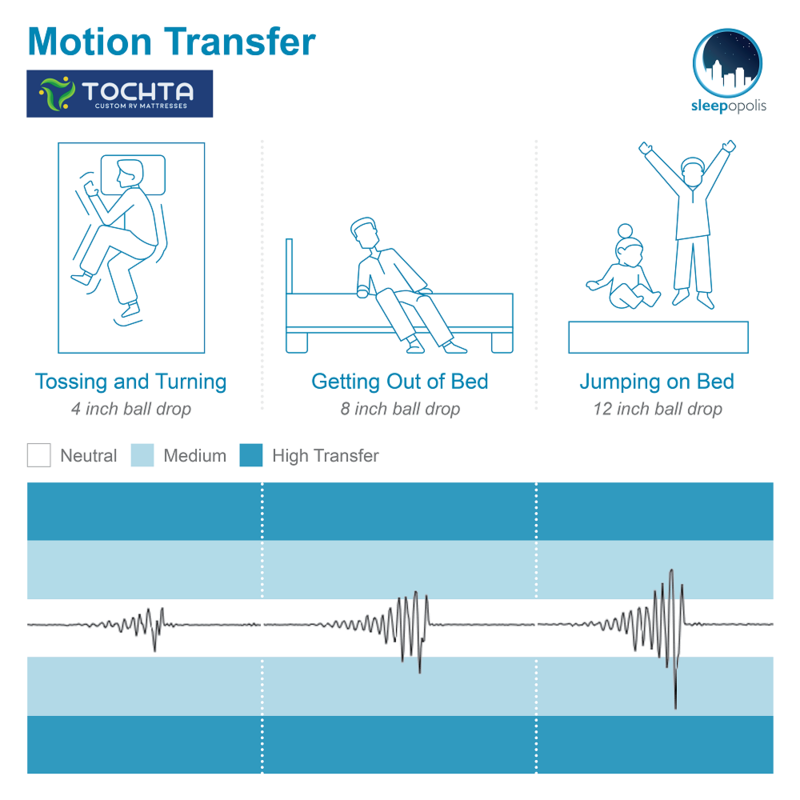 Next up, let’s chat motion transfer, which will be particularly important for those of you who plan on sharing your bed with a partner. Basically this test is going to let you know how much disturbance is detectable across the surface of the mattress i.e. whether or not your bed mate’s tossing and turning in the night is going to drive you up the wall. I’d say these are pretty strong results! 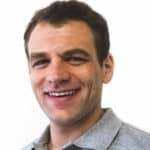 While there’s a steady increase of disturbance with each drop, the memory foam in the comfort layer does an excellent job of containing the majority of this motion. What this tells me is that you’re not likely to be too disturbed by your partner’s movements in the night. Sleep with a partner? Check out my top mattress picks for couples! And the last factor to consider when buying a new bed: sinkage, or whether you’re going to feel like you’re sinking “into” the mattress or lying “on top” of it. These results are about what I expected from the Utopia and tell me that while you’ll experience some pretty satisfying sinkage from this bed, you’re not likely to feel too stuck in the structure. The quick response of the memory foam layer coupled with the bouncy latex beneath it ensures this, creating a soothing yet buoyant structure. Shipping: Free, arrives compressed in a box. Since every mattress is made to order, they generally take up to two weeks to ship. Customization: While the various Tochta mattresses come in standard sizes (Full, Queen, King etc. ), customers really do get to play around with almost every other aspect of the design. Not only can they specify thickness and height, but they can also request cut or rounded corners depending on the space in their RV or truck. And don’t worry—Tochta walks you through all the different measurements you need to take with an easy-to-follow interface on its website. If you’re convinced the Tochta is the right mattress for you, the size and pricing information for the mattress are below. Please note that these prices reflect the standard sizes for the Utopia with a 10” profile, but could change depending on how you customize the bed. If the Utopia is for you, be sure to use the code SLEEPOPOLIS to save 5% on your purchase! 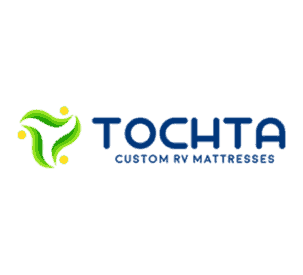 IS THE TOCHTA MATTRESS RIGHT FOR YOU? I think the Utopia would make a fantastic pick for anyone who wants that classic memory foam feel without the stuck-in-the-bed feeling that’s often associated with the material. The mattress is also great for side sleepers as its gentle foam layers do an excellent job of cushioning the shoulders and hips. And finally, one of the biggest selling points of this bed is its customization. If you own an RV, truck or trailer and have had issues finding a bed to fit in the space, Tochta might just be the solution you’ve been waiting for. If you’re looking for a bouncier supportive vibe (the kind you might get from an innerspring or hybrid model), the soft foam feel here may not be ideal for you. Similarly, strict stomach sleepers may find the Utopia to be too soft for their tastes and may want to check out the brand’s firmer beds. For more information on the Tochta, visit its website here!